Marathon recovery is critical for your body – how you treat your body post-race may be just as important as how you treat it during training. — Neglecting proper recovery can lead to potential injuries because your muscles need to rebuild and repair after the race. Be sure to incorporate a strong recovery plan when preparing for your next marathon by utilizing the following tips. Get warm: Change clothes and grab a blanket. Even in warm weather, many marathon runners find they feel cold right after the race. Warming up your body after the marathon will help counter heat loss and can keep you out of the medical tent. Put your feet up: Find a comfortable spot where you can lay down, relax and elevate your feet. Spend 15 to 20 minutes resting to get your blood flowing and your mind to relax. Eat a small recovery snack: Reach for a snack that provides protein to help reduce muscle breakdown and stimulate growth and repair, as well as carbs to refuel depleted energy stores (muscle glycogen). Check your body: Assess your aches, pains and blisters. Seek medical attention if needed. Rehydrate: After crossing the finish line, sip. plenty of fluids. In addition to water, your body needs electrolytes to replenish what’s lost in sweat. 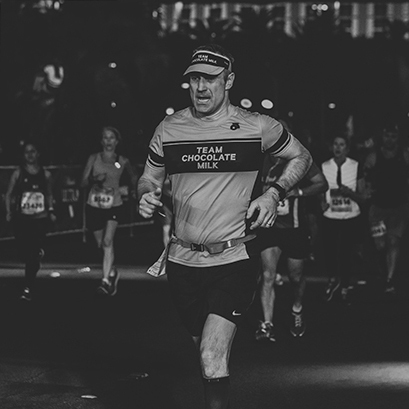 Chocolate milk is a natural choice when it comes to electrolytes, providing many of the same electrolytes that are added to commercial recovery drinks (calcium, potassium, sodium and magnesium). Rehydrated, had a recovery snack and rested? Check. Now that you’ve taken care of your immediate needs, it’s time to take your recovery to the next level. Stretch, stretch and stretch some more: Within the first hour after crossing the finish line, stretch to help avoid soreness later on. Take an ice bath or shower: An ice bath will not only help prevent soreness post-marathon, it can also help you mentally recover as well. The temporary discomfort will be well worth it. Eat a well-balanced meal: Within two hours after the marathon, you’ll likely find yourself hungry again. Eat a well-balanced meal with a good ratio of carbohydrates, proteins and fats to fuel your body with the post-race nutrition it needs. How Long Should You Rest After a Marathon? Some recommend runners should rest one day for every mile run in a race. While that can serve as a good rule of thumb, the answer to the question “how long should you rest after a marathon?” depends on many variables. The post marathon recovery period is ultimately up to the individual, so listen to what your body is telling you, and don’t feel pressured to start running again before you’re ready. Get a massage: While it may seem like a luxury, it’s important to target sore muscles as part of your recovery. Using a good foam roller can also help in a pinch. Sleep: Take naps when you can to help your body get the rest it needs to recover. Stay Active: Keep in mind that “rest” doesn’t mean zero activity. It is important to stay active to keep muscles from tightening up – even brisk walks can help. After a few days, when your body starts to feel ready, low-intensity exercise can promote circulation to help with muscle healing and recovery. Why is Marathon Recovery Nutrition Important? Post-marathon nutrition can reduce the chances of injury and boost your overall health and well-being. Meals containing both carbs and protein are scientifically proven to help with recovery after exercise; the mix of protein and carbohydrates help replace muscle glycogen lost during exercise more quickly and high-quality protein stimulates muscle repair and helps increase growth. What Are Easy Post-Marathon Recovery Foods? Lowfat chocolate milk: In addition to carbohydrates and high-quality protein, the fluids and electrolytes in chocolate milk help refuel the body by replenishing sweat loss. Turkey and Cheese with Apple Slices and Pretzels: Turkey and cheese provide protein and apple slices and pretzels contain carbohydrates making this an easy and great snack after exercise. Tuna on Whole Wheat: This is a filling snack to recover after a tough workout and contains the right carbohydrate-to-protein ratio. Banana and Peanut Butter: Along with carbohydrates, bananas contain potassium and magnesium, two electrolytes that are lost via sweat during exercise. Internal links within this website are funded and maintained by the Milk Processor Education Program All other outgoing links are to websites maintained by third parties.